Don’t mind my busted earbuds. My retro headphones keep shorting out or breaking. I’ve done twists with my own hair a million times and I love them and get complimented on them frequently (people always think they’re locs when the two strands start curling up on themselves too), but I wanted to do a protective style that’s a little different from the usual rotation. I’ve never done box braids with my natural hair aside from larger ones for braid-outs. I decided to do them this time around because they stretch hair, show length better so I can gauge growth, and aren’t as prone to shrinkage as twists. I’ve been reluctant to do them since I went natural because I was afraid my hair would get tangled and I wouldn’t be able to remove them without ripping out hair if I did them too tiny and I didn’t want to do them too big and look like a little kid. Since this was my first time doing them for the purposes of wearing them as a style and I’m still afraid of tangling, I did them small, but big enough where I can easily undo them with my fingers. Next time, I’ll do them mini sized and more uniform in size and shape. 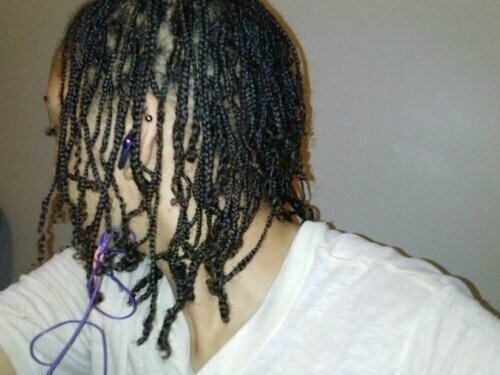 I just grabbed sections at random instead of twisting in rows like I normally do. I started on stretched, dry hair and after I was done, I spritzed with my Elixir, applied TRESemmé Split Remedy leave-in from tip to root, them smoothed Eco Styler gel over them, pinned them around my head in a fashion similar to a wrap, then tied them down with a durag and a satin scarf to prevent frizz and keep the twisted ends stretched. I like them and I think they turned out pretty great, but I wish I would have braided them smaller so they would appear more dense and full. 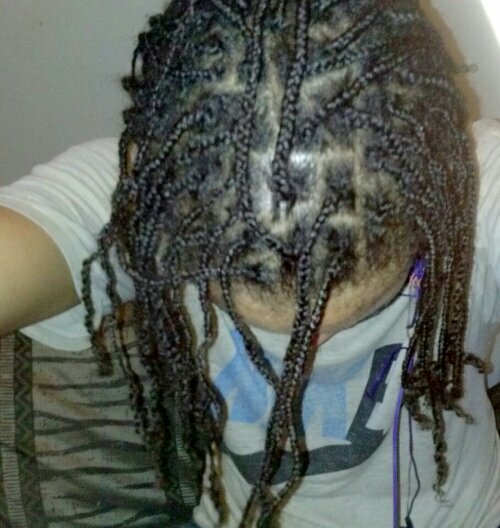 I don’t like a lot of scalp showing with styles like this. I know better for next time. I’m keeping these in for two weeks and from there I may section off braids and undo, detangle, and re-braid into mini braids or mini twists. We’ll see.